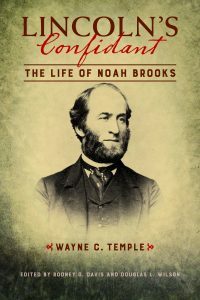 Check out an excerpt from Lincoln’s Confidant by Wayne C. Temple, in which Noah Brooks completes an 19th century approximation of our modern-day personality quizzes. Through his answers, we get a sense of Brooks’s humor and easy-going nature, giving us a hint of why he was so popular in his time. One of the best keys to [Noah Brooks’s] personality is the set of answers which he penned into Edmund Clarence Stedman’s album. These self-appraisals were written about 1878; although obviously some of the answers were written in jest, many of them ring true. Tree? The brave old oak. Object in Nature? The Sea. Hour in the Day? Dinner-hour. Season in the Year? A California Spring. Style of Beauty? I like ’em all. Painters? Helios, Rubens, Hans Makart, Diaz. Piece of Sculpture? The California Butter Woman. Poets? The Divine Williams, Tennyson, Whittier. Poetesses? Mrs. Browning, Jean Ingelow. Prose Authors? Addison, Goldsmith, Dickens, Irving. Character in Romance? J.S.C. Abbott’s Napoleon. Book to take up for an hour? Never have so much time. What book (not religious) would you part with last? Richardson’s Dictionary. What epoch would you choose to have lived in? The present. Where would you like to live? Where SHE is. Favorite amusement? Building castles in Spain. What trait of character do you most admire in man? Cheeriness. What do you most detest in each? Insincerity. If not yourself, who would you rather be? Tupper. Idea of happiness? Lots of money and nothing to do. Of misery? Work and poverty. Dread? That I shall not find HER. Your distinguishing characteristics? Laziness and good nature. Of your better half? Patience under tribulations. The sublimest passion? Give it up. Aim in life? To have a good time and help others.